With the dawning of the internet age we’ve received technological advancements that have made our lives easier and more connected. But with every ying there’s a yang. And in this case, the yang is a rather frighteningly persistent cabal of hackers, internet con artists, phishers and Nigerian princes. Thanks to these groups, and more, October is now known as National Cyber Security Month. What you’re looking at now is the new homepage for Precision Cutting Services. 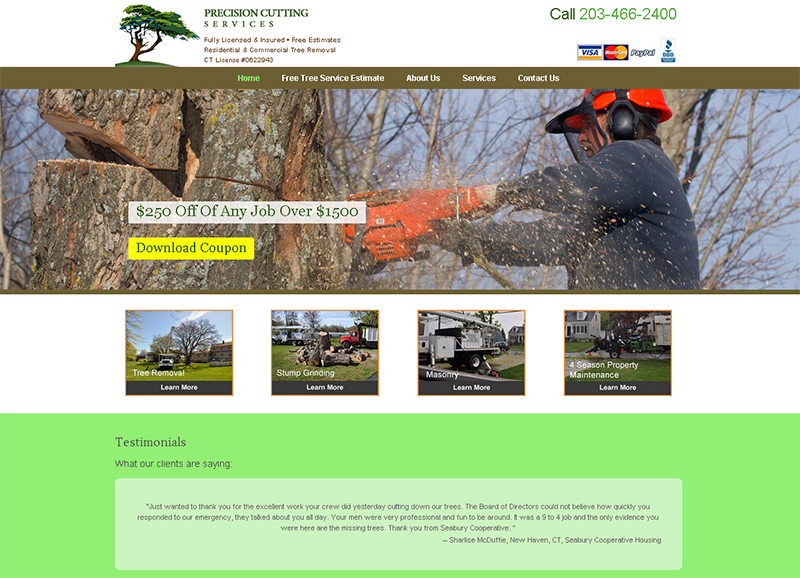 Precision Cutting Services is a high quality tree cutting and lawn care business that performs work in the Hamden and southern Connecticut area. We’ve been performing a wide range of work for Precision Cutting Services for quite some time now. As stated above, we just relaunched their site with a new responsive theme which provides their web portal with several great features. First of all it looks great. It features large, clear pictures of the Precision Cutting Services’ crew at work. Moreover, the theme transforms the website into a responsive viewing experience for mobile devices and tablets. So now it will look just as good on them as it already does on desktops and laptops. Creating sites with responsive themes serves to not only improve their look but also helps their rankings as it is one of the many features that Google takes into account when placing sites in search results. Think your company’s website could use some sprucing up? Then don’t hesitate to contact us. We recently performed a complete relaunch of Bobmarino.com. The site is completely updated, featuring new images and design elements incorporated by 3PRIME. It is now a responsive WordPress CMS system. Recently, 3PRIME co-owner, Ryan Turner was interviewed for an Inc.com article. The article is called “How to Dramatically Increase Pageviews on Your Website” and it has a ton of great SEO insights from Ryan and a number of search engine optimization experts. Take a look at the article and if you still need help from an SEO expert then one is just a phone call (or email) away! The other day I came across an excellent article from Harry Brignull on TheVerge.com, which I wanted to share with you. In it Brignull dissects Dark Patterns. Ominous sounding, I know. You may not have heard the term before, but I’m sure you’ve encountered them in the past. Love them or hate them, hashtags have become a big part of the way we communicate with each other online. And they’re only going to become more pervasive thanks to the latest changes being made to Facebook. There had been rumblings about Facebook fully embracing hashtags on their platform for a while now. And really, people have already been using hashtags on the site for a while. Facebook is just giving hashtags greater functionality, by making them searchable and turning them into clickable links. Once clicked, a hashtag will not bring up a feed of posts that have been used with that hashtag. Facebook has already started rolling out the changes, but they won’t be in effect for all users right away. Facebook will begin rolling out the changes today, but they won’t be in effect for all users. This new development can help businesses in several ways. First, while Facebook hasn’t announced this feature, it’s to be presumed that they will be offering advertising space in the trending hashtags section. This will give businesses a chance to engage and be noticed by potential customers while participating in timely discussions. And secondly, it will give businesses the opportunity to monitor popular conversations and produce related, engaging content. It will take a while to see just how big of an impact hashtags will have on Facebook, so stay tuned for more info. 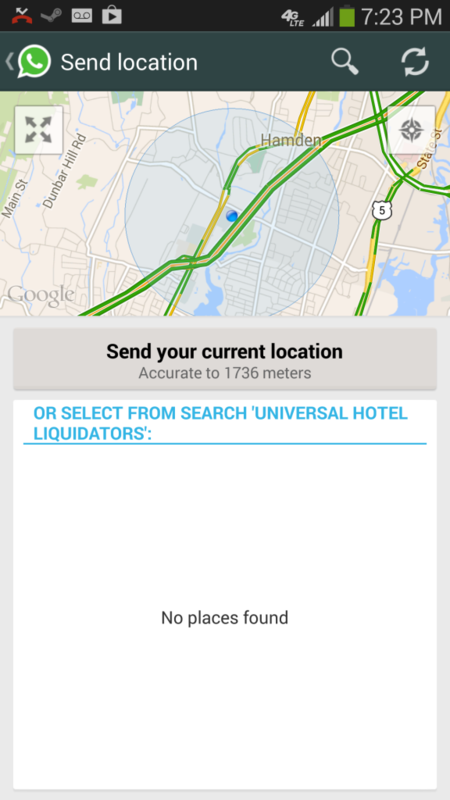 Is the information your customers are looking for there? We were turned onto an interesting article earlier by none other than JTECH Communications. JTECH is one of our long time web support clients that just happen to be doing some really interesting things with mobile, as you can see with their product Spinnaker. The article in question deals with the different ways that mobile device users utilize their devices to find information about a business. The article focused on restaurants but it really applies to any business really which means its important to have already prepared the information that your customers are looking for. We realize this is easier said than done so if your business needs a mobile optimized website with affordable, timely and expert management, contact 3PRIME. We receive a lot of questions at our site, and we’re happy to answer them–it allows us to get in touch with potential customers and also, at the very least, provide people with some good advice. Recently, we received a question from Carrie B. about an issue that I’m sure many of us have wondered about at one time or another. I want to create an increase in my income situation, can you please help? 3PRIME provides services to help businesses increase their visibility and the ability of customers who go to their web properties to become customers. To figure out where we would recommend you make investments, here are several questions, and you can give me a call to review them. What is your website domain? Why do you think your customers would be better served with a mobile optimized website? Are there particular keywords that potential customers might use to find your products/services? Have a similar question to this one? Well don’t hesitate to contact us.